I've never seen Pink Floyd live. And although October will bring the legendary British band's 15th album, The Endless River, they might not tour. The perennial visit from The Australian Pink Floyd Show—a tribute band—may be as close as I'll come. I'm OK with that. Being a music journalist is all-you-can-eat perks: free CDs, DVDs, rare promotional goodies, tickets, artist access—those last two are the best. You get to witness great performances and interview fascinating people. Still, there are drawbacks to all of these perks—again, the last two in particular. With interviews, you might discover that someone you've held in high esteem isn't very nice. That can affect your enjoyment of their work. That didn't happen when I interviewed Pink Floyd singer/guitarist David Gilmour in 2006. He was engaging and enthusiastic. Me: Those bends you hit in your solos—they're sublime. It's like you're bending my spine. Do you experience them the same way? Gilmour (audibly smiling): "Oh, yeah—you know when you've got off a good one." The fact that Gilmour derives such genuine joy from the music, after playing it for 40 years? It lets you know your fandom is well-founded. It reinforces your experiences of the music, and makes you protective of them. "We've had similar first experiences with this music," says bassist/vocalist Colin Wilson of The Australian Pink Floyd Show. For him, it was hearing The Dark Side of the Moon "in a pitch-black room with a couple of my mates from school," he says. "Nobody said a single word for the entirety of the album!" For me, it was many midnight showings of Laser Floyd at the Hansen/Clark Planetarium—all those Dark Side of the Rainbow sessions. A lonely desert drive with Dark Side and Wish You Were Here played back to back. But it was a canyon drive where I first really listened to Pink Floyd because my stoner buddy said, "Floyd good." The emotion in his emphasis made "good" mean incredible, transcendent. Epic and awesome—before we beat the meaning out of those words. That's what Pink Floyd means to the fans, whether it's all the young noobs with their Walmart-bought prism T-shirts, the hoary originals or the converts in between. The music flows in and out of reality and ethereality. It's a drug-less head trip that pulses with substance. It would be amazing to see Pink Floyd live. But the pre-recorded music is tethered to great moments in my life. I wonder if the live spectacle would cheapen those. Certainly, it would dwarf them. Instead, there's The Australian Pink Floyd Show. Heresy? Maybe. What proper Floyd fan would settle for Faux-loyd? "The early years for the band were hard," Wilson says. "It was very difficult to convince the Pink Floyd audience, who are extremely passionate and loyal, to give us a go. People didn't want to believe that anybody else could ever get close to sounding like them." But the resemblance is striking. So much so, that after 25 years, TAPFS is more popular than ever. They tour more than the original band. 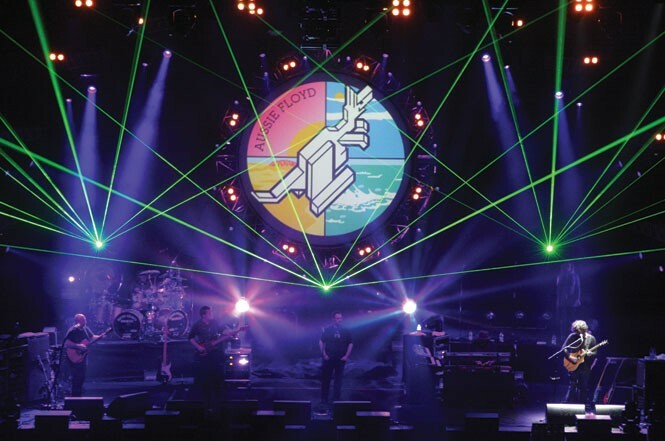 They boast one-time Pink Floyd backing vocalist Lorelei McBroom as a member. Colin Norfield, sound engineer for the original Pink Floyd and Gilmour's solo tours, is working with TAPFS on this tour. Gilmour himself had the band play his 50th birthday party. And if he's OK with TAPFS, that's saying something. "What people tell us now," Wilson says, "is that being able to experience the music performed in an arena by a live band who are devoted to faithfully and accurately re-creating Pink Floyd gives another element to the music—another experience that doesn't take anything away, but adds a new dimension."